What makes the first technology special is that the continuous fiber reinforced thermoplastic preform is transformed, overmoulded and decorated in a single step. The integrated process makes it possible to save cycle time, reduce the use of raw materials and emission, and requires less energy. 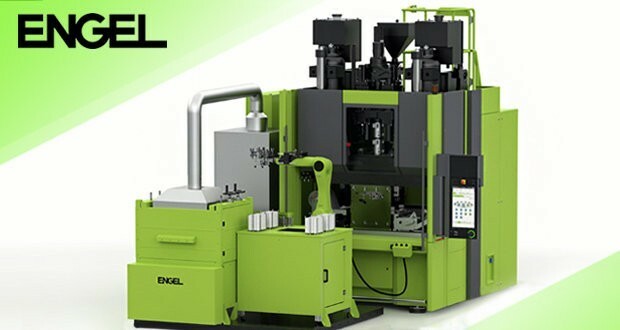 The heart of the production cell is ENGEL insert 500V/130 single injection moulding machine with a roll-to-roll IMD unit, an ENGEL easix six-axis robot, which takes over the entire handling of the semi-finished and finished parts, and an infrared oven which was also developed and built by ENGEL for preheating the thermoplastic fabrics. The equipment has been developed specifically to work with continuous fiber reinforced composites, and was showcased on the exhibition stand. At K 2016, the attendees could also see the ENGEL IR ovens as a complete series. ENGEL easix six-axis robot and IR oven are fully integrated into the control system of the CC300 injection molding machine. The upgraded ENGEL injection moulding unit uses the second technology. The first prototype of this machine appeared in 2012. The advantages of the technological solution the company presented in Dusseldorf are a significantly shorter material dwell time, a reduced thermal load, and thus increased product quality. The method allows the manufacturers to work with dry pre-formed continuous fiber-reinforced thermoplastic fabrics. The proposed technologies can be used in automotive, electronics and other industries that require advanced technical methods of injection moulding. These solutions were created with the participation of Bond-Laminates (Brilon, Germany) and LEONHARD KURZ (Fürth, Germany). The global specialized trade fair for plastics and rubber K Show 2016 was held for the 20th time. Traditionally, this event brings together the leaders of the polymer and related industries. Thus, not only did ENGEL present the manufacturers of injection moulding machines, the well-known Austria-based Wittmann Group was also among the participants.